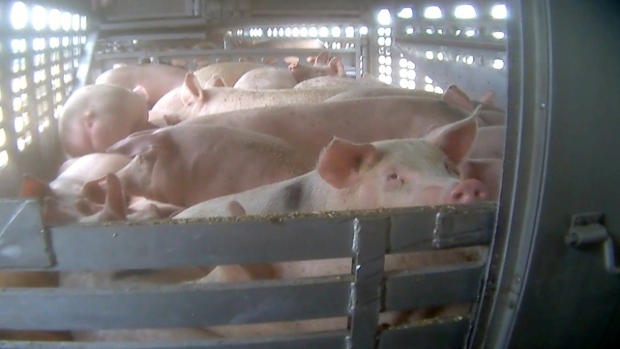 Pigs are crammed into a transport truck en route to slaughter, as uncovered by a Mercy For Animals Canada investigation this year. Today’s show features an interview with Krista Osborne, the executive director of Mercy For Animals Canada, about the horrors faced by farmed animals during transport to slaughter. The group recently released video of its undercover investigation into routine practices within the animal transport industry, which aired on the news magazine show W5 this past Saturday and is the latest in a series of such undercover work to expose what really goes on within the animal agriculture industry in Canada. MFA’s most recent undercover operation was at Western Hog Exchange in Red Deer, AB, where the undercover investigator said she was witness to “animals that were too sick to stand, that were later kicked and abused by employees”. Previous Mercy For Animals undercover investigations have exposed rampant abuse on a Chilliwack dairy farm–the largest in the country–that included viciously kicking, hitting, and punching dairy cows; sickening cruelty inflicted upon baby calves at a Québec veal farm, including violent beatings; baby chicks being flung by their fragile wings, scalded and drowned, as well as birds being crammed into macerators, then ground up alive at an Ontario hatchery and the kicking, throwing and spine crushing of turkeys on an Ontario turkey farm, among others.